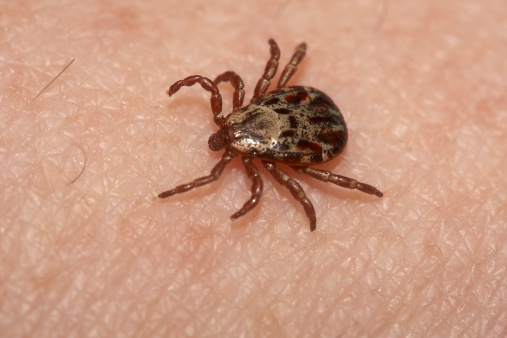 A breed of tick called Amblyoma americanum is thought to be behind the spreading of a new potentially life-threatening disease dubbed Rocky Mountain spotted fever (RMSF). Though it may not sound fierce, if left untreated for five to eight days, RMSF is likely to be fatal. From 2000 through to 2012, there has been a rise in the number of Rocky Mountain spotted fever cases—eight times the normal number of occurrences. But when the numbers suddenly fell, doctors were left somewhat confused and wondered if the fault lay on their side in not being able to diagnose new strains of RMSF. A recent study in the American Journal of Tropical Medicine and Hygiene, however, points the finger at what it calls the lone star tick. This is an aggressive tick that typically harbors in dogs in the southeastern United States. Recently, it has begun to move north in correlation with the new surge in occurrences of Rocky Mountain spotted fever. How is the tick moving north? Well, simply put, it’s hitching a ride; white tail deers basically carry lone star ticks north. Additionally, warm winters and a multiplying deer population has spread this very real threat to the point that it is “extremely prevalent in a huge swath of the country,” as Dahlgren describes. Further research and blood tests confirmed that there is a rise in the diagnosis of Rocky Mountain spotted fever along the path of the lone star tick’s migration, but that this is actually a misdiagnosis caused by a genetically similar bacterium called Rickettsia amblyommii. This bacterium is what is present in all cases of RMSF but is only carried by about half of the lone star ticks travelling the country. On the positive side, this similar strain brought on by the lone star tick is not killing nearly as many people. In a more theoretic hypothesis, Dahlgren believes that the similarity in strains may be acting as a vaccine to the actual RMSF. This conclusion is based on decreased rates of deaths and hospitalizations that trail the path of the lone star tick. However, Dahlgren says the similarity and misdiagnosis means “It’s not 100 percent good news because it’s harder to find actual outbreaks of Rocky Mountain spotted fever.” Not being able to identify cases means it becomes harder to track and prevent outbreaks from occurring. Because of the aggressive nature of Rocky Mountain spotted fever, it is still suggested that doctors treat the similar strain in the same manner. While not all patients infected will experience the same symptoms or to the same degree, potential symptoms of Rocky Mountain spotted fever include fever, rash, headache, vomiting, abdominal and muscle pain, loss of appetite, and redness in the eyes. If diagnosed early on, RMSF patients can be treated with an outpatient prescription and recover rapidly; if caught in its later stages, care may require antibiotics delivered via intravenous, hospitalization, or intensive care. Bichelle, R., “The Lone Star Tick May Be Spreading A New Disease,” NPR web site, October 28, 2015; http://www.npr.org/sections/health-shots/2015/10/28/451990557/the-lone-star-tick-may-be-spreading-a-new-disease-across-america. “Symptoms, Diagnosis, and Treatment: Rocky Mountain Spotted Fever (RMSF),” Centers for Disease Control and Prevention web site; http://www.cdc.gov/rmsf/symptoms/, last accessed October 29, 2015.